The video demonstrates the case of a man with visualized pancreatic duct stones on a CT scan that were discovered during an evaluation for pancreatic-type pain. Standard ERCP techniques including pancreatic sphincterotomy and balloon sweeps of the duct did not produce significant stones or stone material despite this having been visualized on the CT scan. A second ERCP was performed with a pancreatoscope which demonstrated the exact location, size, and number of pancreatic duct stones. It is possible that the stones were slipping into dilated pancreatic duct sidebranches on the prior ERCP or that the retrieval balloon was simply able to slide by the stones. The information gained via pancreatoscopy allowed the stones to be specifically targeted for capture and removal via a stone retrieval basket. This maneuver was performed repeatedly and was successful. In this manner, the pancreatic duct was cleared of all stones in the same session in which the pancreatoscopy was performed. 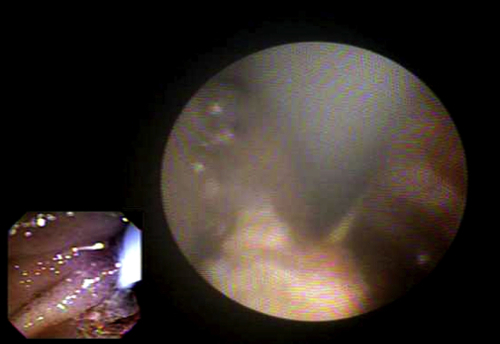 Pancreatic stone removal can be challenging, even for expert endoscopists. This video demonstrates the inherent value of pancreatoscopy in evaluating the pancreatic duct for pancreatic stones, and showed how the information gleaned from such a procedure can be used to facilitate stone removal. Figure 1. A large, irregular pancreatic stone seen on pancreatoscopy. I think that other endoscopists can watch this video and recognize that even in the setting of negative balloon sweeps of the pancreatic duct that significant pancreatic duct stones and/or stone material may be retained in the pancreas. The main pancreatic duct, unlike the common bile duct, has sidebranches that can be quite large (especially in patients with chronic pancreatitis). Pancreatoscopy can help to identify if any stones are left in the pancreatic duct and can help facilitate removal. Pancreatoscopy is a relatively high-risk procedure, and physicians should have significant experience with cholangioscopy before attempting pancreatoscopy.